talktalk - Page 3 - The Scream! Try this program - free down load - it took me from 2 Mbs on Talktalk to 7 Mbs. I even get 500K across the Atlantic 5,000 miles. Merry Christmas and Happy New year to everyone if I'm not on again this month. There is worse than talktalk - my laptop connected to my neighbours router by mistake - on Virgin - I thought I was back on dial up! It costs a lot more too. I'm on Talk 3 Intenational - £20.50 a month and I can call cell phones in North america for free amongst other things like 7 Mbs broadband - and I'll call my friend in France this weekend for free. 500k across the Atlantic is not good; talktalk seem to bottleneck on their own uk network, international routing is often better. Eg at peak times when I get 1.5mbs to the uk tests I can ofter get better than 9mbs to the dublin test servers. You may still want to increase your tcp rx window for the higher latency. 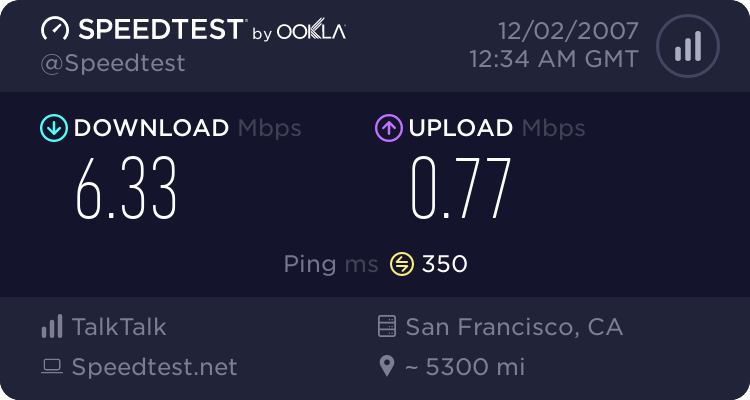 This is my current test to the us west coast, and this is low for this time of night. I've noticed this topic has been going since 2005. Just to let anyone new here that they still have the same problems. A friend has just had her contract cancelled and had all her payments ordered to be returned by the Ombudsman. She had signed up in December, managed to get web access by February and had problems with every part of their 'business package'. Emails are still taking weeks to get answered, if at all and phone calls take you through a maze of departments before finally ending up where you began. It is a pity people do not find these forums until after parting with their cash and/or signing a contract. When I start my browser afresh and type in www.lionheart.talktalk.net I end up with talktalk's own homepage. What do I need to do so that anyone typing my webaddress into their browser sees MY page? Thanks in advance of any assistance offered. Got it. Thank you kindly. Joining any community is like a trend in these days sometimes people joined for getting some entertainment but sometime they want to get useful information and knowledge from other community members. I am new in thins forum and want to find out good friends i find this community is highly interesting. All times are GMT +1. The time now is 10:49.